From 1892 to 1896, James Wilson Morrice was living in Paris. 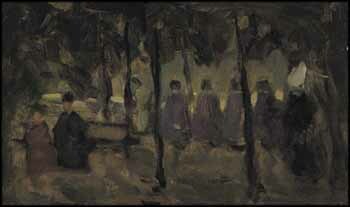 This charming pochade, an oil sketch on a small wooden panel, painted en plein air, is documented in the archives of the Montreal Museum of Fine Arts by a photograph titled Nuns in a Park. However, clearly this image is a group of uniformed schoolgirls under the direction of a nun, identified by her cornette - a wing-shaped white wimple. This distinctive headdress was worn by the Daughters of Charity, whose mother house was in Paris and who had many convents in France. With soft, assured brush-strokes, Morrice captures the tranquil ambience of this urban park setting in which shade and sunlight intermingle. For this master Canadian Impressionist, this was a classic subject - Morrice was greatly attracted to Paris's public gardens such as the Tuileries, the Bois de Boulogne and Luxembourg Gardens, where he painted delightful scenes such as this, of people enjoying respite from the city in sylvan settings. This work is included in the catalogue raisonné on the artist’s work that is currently being compiled by Lucie Dorais.